After my last post extolling the virtue of lilacs, it should come as no surprise that my plant pick for this past week was a lilac. This handsome fella was also featured in that post. Why so enamoured am I? Well for one, the colour – intense, dark red-violet buds open to gorgeous, slightly softer hued florets. As well, Ludwig Spaeth is a very early bloomer – in my garden the first florets open up about the time the earliest of the flowering crabs are blooming. The blossoms are still going strong several weeks later when the blue oat grasses are sending up their arched inflorescence. And they will still offer robust splashes of colour well after most other cultivars of this species have faded. The only deficiency is that the scent is so reserved – while it has the classic lilac aroma, one must have the nose buried right in it to experience it. Now as you know, the scent of lilacs makes me positively giddy, weak in the knees even, so the lack of fulsome fragrance was a bit of a disappointment for me. And this is precisely why I’ve chosen Mr. Spaeth as my Father’s Day Plant Pick – for my husband, father of my children, who loathes the smell of lilacs – this one’s for you. 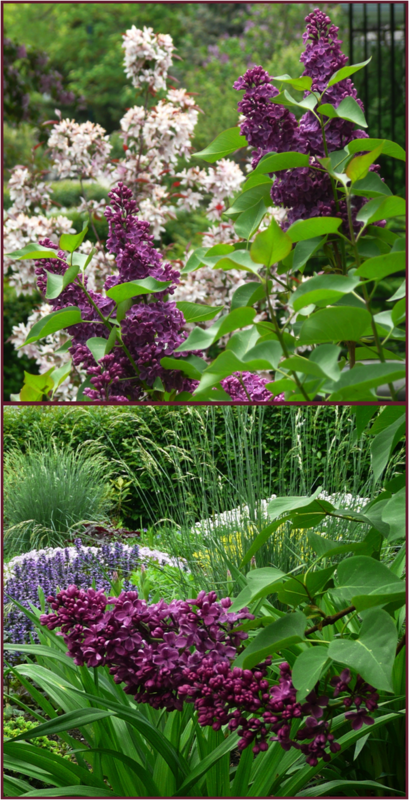 This entry was posted in Designing with Plants and tagged Design, Gardening, Lilacs, Syringa, Syringa vulgaris 'Ludwig Spaeth'.